Me? Oh, I'm good. Had a day off work today so I've been trying some whisky. Today it's been some lovely spirit driven Caol Ila I bought on my trip to Islay. You'll remember I didn't actually buy anything when I went on the tour of Caol Ila Distillery, but on the last day of the trip I popped into the Spar in Bowmore which has a big collection. In fact every small shop on Islay has a better whisky selection than most megasupermarkets around here. I didn't want to buy something hugely expensive and wanted to buy something from Caol Ila or Bowmore because I found the OB's to be a little disappointing. Bowmore a lot more than Caol Ila for the record. Nose: Creamy and sweet. Quite light and ethereal with classic lemon, banana, pineapple and some mango. A mineral side that hints at Bruichladdich with some smoke and medicinal notes as well. Some light malt with brown bread. Water: More malt, more brown bread then more citrus with lots of lemon and some lime. After a bit- More leafy and earthy with wet leaves, green apple and some young smoke. Toasted brown bread, smoked vanilla pod, a little biscuity. 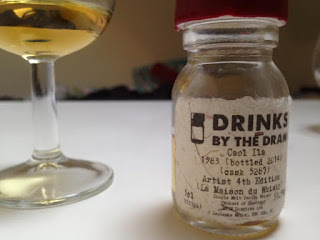 Taste: Light arrival, prickling alcohol with lemon juice and peel, building oily smoke, light lemon, very mineral development (Reminiscent of an Octomore for me) with smoke and sea salt, a little scorched wood too, charcoal. Water: Sweeter, fuller arrival. More prickling development with sour citrus, lemon and lime, then going smoky with very oily mineral notes. Peat smoke and salty lemon juice. 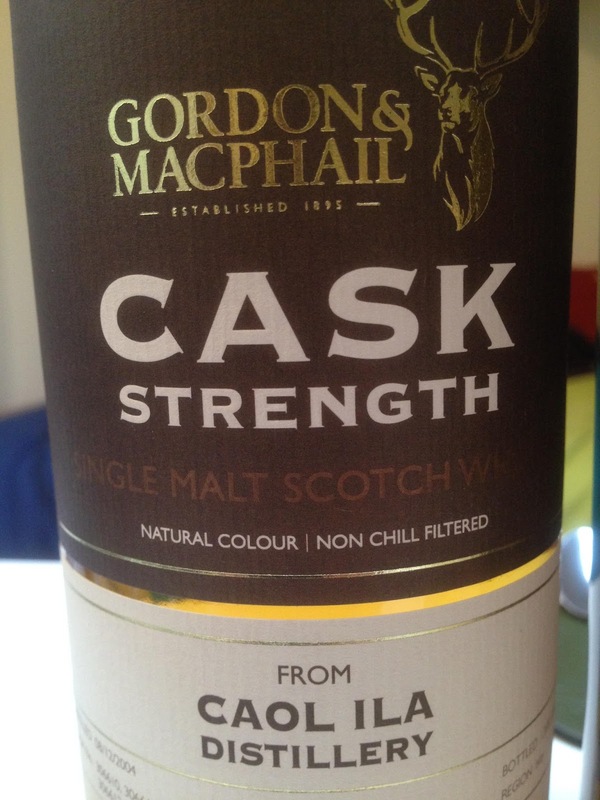 More water: More sweet again, green apple, more peat smoke, peated malt. Even more water: Green banana, smoked pears, bonfire embers, a little hot with white pepper and ginger. Finish: Medium/Long length. Light smokiness with salty lemon juice and oily mineral stoniness. Notes: Distilled 08/12/2004, bottled 13/02/2015. 10 years old from 4 1st Fill and Refill Sherry Butts. Very distillate driven, very clean. Reminds me of Octomore or Bruichladdich spirit with the mineral notes. It's rather excellent and it's getting better the more the level is going down. As per usual, when you leave a whisky at CS, don't colour or chill-filter it can be great even when it's young. Hold on! I've got a sample of an older Caol Ila to compare it against! Nose: Still quite peaty for it's age. Complex with the peat merging with a BBQ note (quite sweet)- Sweet BBQ sauce, a fantastic sooty lemon note, fizzy lemon sherbet, a little stewed pear, a little fresh pineapple and mango, lots of cough sweets. Underneath that there's windswept beaches- Salty sea air. I find it quite meaty really- BBQ on the beach, slightly scorched pork? Lathered in BBQ sauce. Huge dry oak starting to come out now. After oxidising- Next to no meatiness and a lot more fresh fruitiness. Zesty, juicy and fresh lemon, lime, pear, mango, melon and pineapple. Really reminds me of a more intense 25yo Laphroaig. 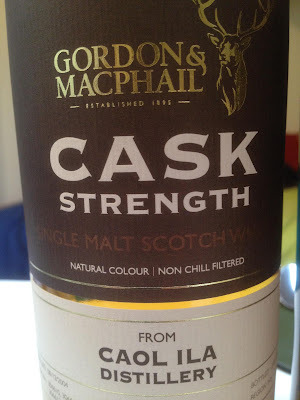 Water: More dry oak, sandalwood, the peat is more smoking heather and less BBQ. Complex lemon- Juice joining the sherbet, lemon fizzy sweets, lemon chewy sweets, delicious grilled pineapple, caramelised honey. A little mineral after a bit with burnt pipe tobacco and cigar. Taste: Sweet initially, then the peat starts creeping out and battles with the immense sweetness. The cough sweets are back, lots of lemon, lemon sherbert, quite fizzy, lime, pineapple, mango, a lot of melon, pineapple, quite tropical and juicy. The oak is there, merging with the peat, driftwood fires, salty dry oak. In short it's huge, hugely complex and quite overwelmingly so. Big sweetness fighting with big oakiness, goes quite quiet into the finish though. Water: The peat and the oak are a bit more creamy, the sweetness more to start and the peat taking over after a bit, peat smoke, quite phenolic with cough sweets. A sherry sweetness starts coming out after some time- Quite juicy with melon, mango, grapefruit and pineapple then very zesty with lemon and lime. Finish: Long/Very long length. Instantly receeds with cough sweets then dry oak and lemon sherbet linger for ages. 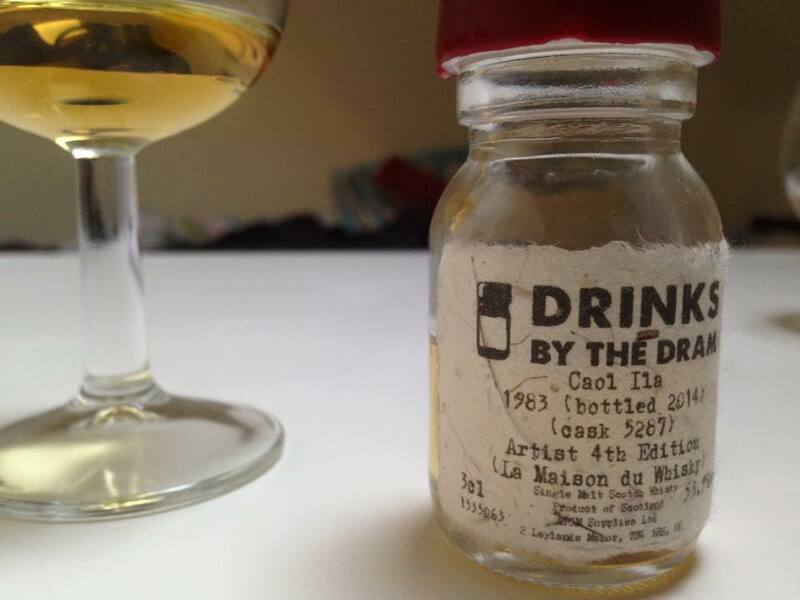 Notes: Distilled 1983, bottled 2014. Just over 30 years old. Bottled for La Maison du Whisky (Signatory stock I think) from a single Hogshead. I'd guess Refill Bourbon. This stuff is big and perfect. Wowzers. Can't wait to try the 30yo OB! This was actually very different from when I first tried it, it was a lot more meaty and BBQ-y. Now it's a lot more like an old Laphroaig with the fresh tropical fruit.